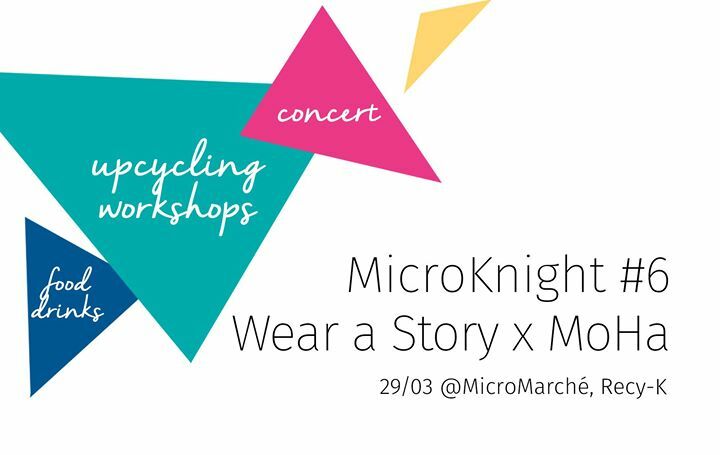 Wear a Story vous invite au lancement de Make your Story lors de la MicroKnight #6. Les ateliers Upcycling & slow fashion “Make your Story” sont une expérience dans l’univers de la marque de vêtements Wear a Story. Grâce à ces ateliers vous pouvez enfin créer une pièce unique qui vous représente en donnant une seconde vie à des anciens vêtements. Venez partagez un moment convivial avec nous durant lequel vous pourrez découvrir l’expérience Make your Story grâce à deux workshops gratuits (nœud papillon et sac réutilisable), le concert enivrant de la talentueuse MoHa (Solo Loop Project) et un dj-set de notre 100% locale MicroMarché dj Kristcoe. Wear a Story nodigt je uit naar de lancering van Make your Story tijdens MicroKnight #6. De Upcycling & slow fashion workshops “Make your Story” zijn een ervaring in het universum van het modemerk Wear A Story. Dankzij deze workshops kunt u eindelijk een uniek item maken die bij jouw past en terzelfde tijd een tweede leven geven aan oude kledingstukken. Kom samen met ons een gezellig moment delen waarbij u de Wear a Story belevenis kan ervaren dankzij 2 gratis workshops, de onstuimige melodie van de getalenteerde MoHa (Solo loop Project) en een dj-set van onze 100% lokale micromarché dj Kristcoe. Wear a Story invites you to the launching of Make your Story during the MicroKnight #6. The Upcycling & slow fashion workshops “Make your Story” are an experience in the universe of the fashion brand Wear a Story. Thanks to these workshops you can finally create a unique item that represents you and give a second life to ancient garments. Join us to share a friendly moment during which you will discover the Make your Story experience thanks to two free workshops (bow tie and reusable bag), a concert of the talented MoHa (Solo Loop Project) and dj-set from MicroMarché’s 100% local dj Kristcoe.